In this book, Cal and Demi are about to launch Kilhallon as a quirky wedding venue and to their surprise their first potential customers are none other than a famous filmstar couple. Trying to get Kilhallon ready and keep the news of the wedding secret proves to be quite difficult not helped by Mawgan Cade who is as always trying to cause trouble. One thing I particularly enjoyed in this book was reading about how the relationship between Demi and her father was deepening, helped by her father’s new partner Rachel and Demi bonding over baby Freya, Demi’s half sister. It was good to see Demi beginning to gain more trust in her family again. It seemed that Cal and his half-brother were also making progress towards a better relationship. Cal and Demi’s relationship became stronger too over the course of the novel though not without some misunderstandings on both sides! The story is told from the most part by Demi but there are also a few chapters from Cal’s point of view giving the reader a better insight into his thoughts and feelings. I have to admit that telling the story in the present tense didn’t quite work for me in this novel. I can’t quite put my finger on why but it didn’t feel quite right somehow. Having said that though, as I hope you can tell from my review, I still thoroughly enjoyed the story. The book isn’t just a romance novel though as it touches on topical issues such as the ongoing war in Syria and how people who are out there either working or volunteering are affected by what they have witnessed and experienced. The difficult situation for families in refugee camps being separated and trying to find relatives and a place of safety is also featured. Confetti at The Cornish Cafe is a really enjoyable, romantic read with a perfect feel good ending. 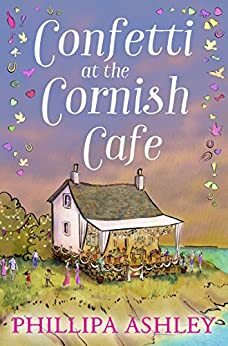 I’m sure I read somewhere that the Cornish Cafe series is supposed to be a trilogy but I’m hoping there might be another book as I’d love to know what happens next for Demi and Cal and Kilhallon. But their first clients are no ordinary couple. The bride and groom are internationally famous actors Lily Craig and Ben Trevone. Kilhallon is about to host a celebrity wedding. Sounds like Cornish ice cream. Comforting and morish! Why can’t I get a paperback copy of Confetti at the Cornish Café? As far as I am aware, it’s only available commercially as an ebook just now though a paperback may follow. I was sent an advance reader copy for review.